Everybody who uses the App Store knows how annoying it is to enter your Apple’s account password every single time you download an app, even if the app is free or to just update applications. To prevent this from happening all you have to do is download PasswordPilot from Cydia. PasswordPilot is a tweak that automatically inserts your App Store account password every time you download or update an application from the App Store. With PasswordPilot after you set your password from Settings, you will never have to insert your password again while using the App Store to update or download. 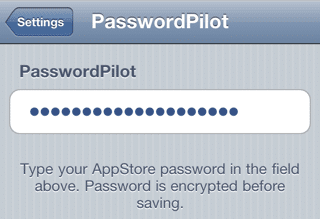 PasswordPilot automatically inserts your AppStore app when downloading or updating apps from the AppStore. Set your password from the Settings.app (passwords are not stored in plain text to limit security risks). You can configure options from Settings.app. You can download PasswordPilot from Cydia on the BigBoss defaulted repo for free!